My Water Broke But I'm Not In Labor. Now What? Ideally, creating a management plan with your health care provider begins prenatally. Find out what your doctor's or midwife's philosophy and protocols are for inducing a woman's labor if her water breaks before labor starts. 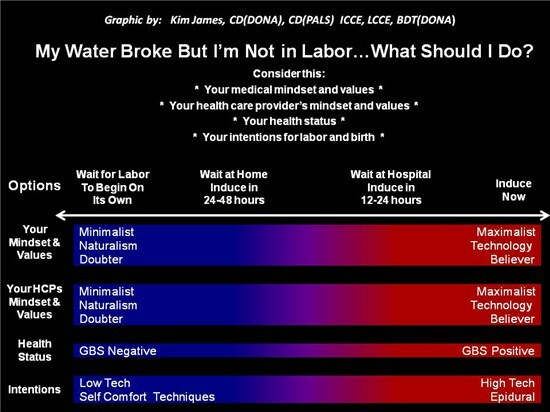 Be sure to describe your desires and reasons for wanting a normal, physiologic labor. Find out if your health care provider is willing to support your goals. Even if your care provider normally prefers immediate induction, talking to your care provider about why you want to wait for labor to start on its own can help you and your care provider find a satisfying middle ground. If you are negative for the GBS bacteria, at term, and healthy, you have some flexibility in waiting for your labor to begin on its own, if that's your wish. "If we induce my labor now, is there a clear medical benefit? Does it outweigh the risks of induction, including failed induction, higher need for cesarean and higher need for pain medication? "What is the likelihood of my induction succeeding?" "How does an immediate (before 24 hours) induction improve my or my baby's health?" "What happens if I wait for 24 hours?" 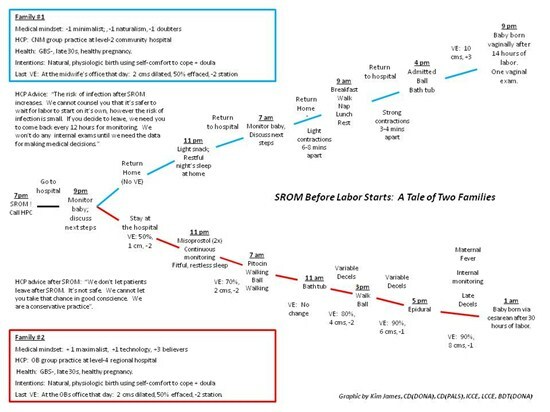 Can you tell me about the relative and absolute risks of waiting for labor to begin on its own? How likely are those risks? "What factors increase my likelihood of infection?" "Are my personal odds of having a poor obstetrical outcome higher or lower than the average?" "Are we treating a known problem or are we treating a potential for a problem?" "Is there a chance we are over-treating by inducing now?" "Are there other things I could do?" Your health and/or the health of your baby will likely improve. Reasons to wait for labor to begin on it's own. Your Bishop Score is unfavorable and the induction is likely to fail. The small rupture may help the cervix continue softening and thinning over the course of the next 24 hours, making the active part of labor more efficient with less need for pitocin augmentation. YES Choose medical interventions when the benefits of the intervention clearly outweigh the risks. NO Any intervention used for convenience can result in HIGHER complication rates for mother and baby. Is mother okay now? Is baby okay now? Consider waiting a little longer before acting. 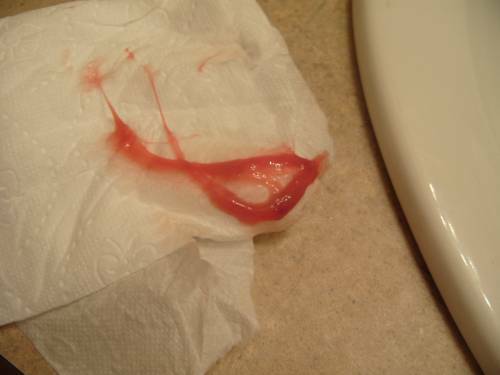 Is this a routine procedure that you offer everyone or is there something unique about my situation? If routine, consider waiting a little longer. Who benefits from the intervention now? Mother, baby, care provider? If only the care provider benefits, consider waiting a little longer. Get a .pdf of this graphic! Get a .jpg of this graphic!